Ge0-political and economic uncertainty throughout global markets are leaving gold and other precious metals without a clear direction. Equities in both the United States and abroad are trending upward as positive economic news arrives from Asia, but trading volume – both for buyers and sellers – remains low for metals. Why is this exactly? There are a few possibilities: some say precious metals trading is typically lower during the summer months anyway; others believe that current global events are creating opposing pressures on gold in particular. What Meager means is that high-profile precious metals traders (market makers in London and New York, for instance) often go on vacation during the summer. With fewer major market participants, trading numbers are bound to fall. While it is true that trading is generally lower during the summer months, low volume alone can't explain the lack of clear direction for both metals and metal futures. Conflict in Iraq is currently grabbing news headlines, but the tension in Ukraine is still unresolved. Foreign capital continues to pour out of Ukraine, and regional banks are concerned about both their balance sheets and their safety. Combined with the major inflationary concerns in Ukraine and Russia, and Eastern European economies are teetering right now. Iraq is less clearly tied to gold, however it does pose a concern to oil supply if the region is destabilized further. Oil shocks could be very bad news for the economy as a whole. Major uncertainty is almost always a good sign for precious metals, owing to their “safe haven” status. Global stocks are performing well and are nearing all-time highs. While stock market performance is often a poor, superficial representation of real economic health, equity gain do impact gold and other precious metals. The Dow and S&P are at or near all-time peaks, Asian markets are near decade-highs, and European stocks remain bullish despite regional concerns. Some of this can be blamed on historically low yields for bonds – investors are being forced from “safe” investments into more speculative ones to chase returns – but whatever the reason, any gains in equities have proven to create downward pressure on metals over the past 6-7 years. China has made aggressive moves on gold this year. India has lowered import tariffs on gold and silver. Russia has both increased precious metals purchases and, reportedly, stolen some 300 kilos of gold from Ukrainian vaults. On top of that, Russia is the world's leading producer of palladium, and regional concerns are driving up palladium prices. India and China are (by far) the two most populous countries on earth. They are both massive importers of gold and silver, and both have displayed increasing appetites in 2014. Rising demand, obviously, is good news for gold investors. I don't get to write this line very often: the dollar has recently posted gains. Greenbacks have been rising against “baskets” of other major fiat currencies, such as the euro. This is in large part to the European Central Bank's recent plans to print lots of euros in an attempt to combat price deflation. An uptick in US bond yields helps. Some traders are also optimistic that the dollar could continue to rise if the Fed raises interest rates. More so that against any other currency, the price of gold has historically carried an inverse relationship with the US dollar. A rising dollar would tend to lower gold prices. Nobody can predict what will happen with precious metals moving forward – there are too many possible variables and nobody can control the outcome of global events. Despite present uncertainty, metals have proven to be a reliable long-term investment and hedge against uncertainty or collapse. The short term prospects might be hazy, but that doesn't mean that the intrinsic qualities of gold and other metals should be forgotten amid the confusion. 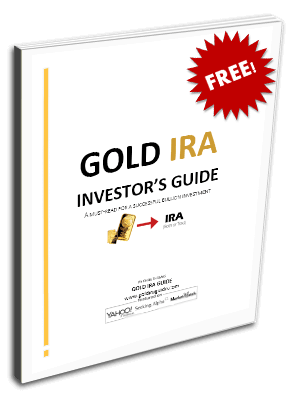 To find out more about investing in gold or other precious metals, be sure to request a Free Gold IRA Investor's Kit courtesy of gold IRA company for 2014.